1.Bench-mount vise with 3" nominal jaw width and provides clamping action for light-duty applications. 2.360-degree swivel base adjusts the direction of the jaws for proper placement and locks in place . 3.Vise has a cast iron body with steel U-channel bar for durability and has a flat portion that acts as an anvil and additional work surface. 4.The finish-milling dovetail groove sliding track for smooth sliding and reliable clamping. 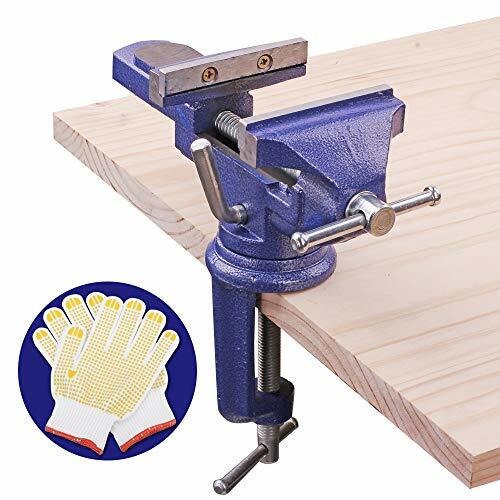 5.The vise is painted with a durable blue powder coat,comfortable to the touch, the paint doesn't come off . 6.Gloves are suitable for any job and guaranteed a pleasure to wear when operating. If you have any questions about this product by TOYOTERU, contact us by completing and submitting the form below. If you are looking for a specif part number, please include it with your message.